The first time you set foot in this complex you are overwhelmed by the beauty of this extraordinary place. Here you can breathe fresh air and open your senses to the elements, the sea, the sky and the captivting allure of the mother nature. Apartments with large terraces from 24 m2 with sea views, closed complex with swimming pools, gardens, garage, storage room, and paddle tennis courts. Located in La Cala del Moral, Rincon de la Victoria. Final delivery 2019. Delivery 2021. 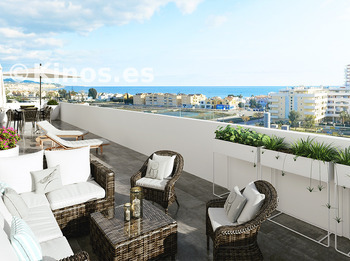 SALE Penthouses and apartments in Torre del Mar beach. Residential with 900 m2 gardens, swimming pool, large terrace, sea views. EQUIPPED KITCHENS, AIR CONDITIONING. Want to see your property here? Send us your contact!